Let me just start by saying how much I have come to love pumpkin anything. 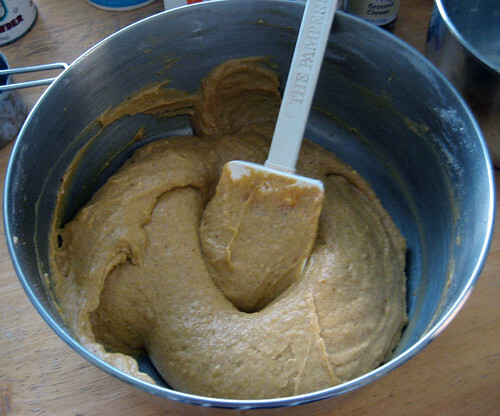 I remember when I was a kid I always turned my nose up at pumpkin pie because it seemed weird. I don't know where I got that impression, but suffice to say, I am no longer so foolish. Pumpkin = delicious. I'm glad there is not supposed to be a shortage this year. Last year, it really messed with my baking plans. Anyway, the pumpkin recipe I bring to you is one I saw on Tasty Kitchen, and I just had to try it. 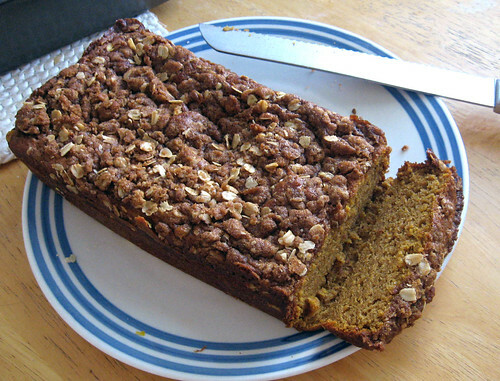 Pumpkin and bread, two of my favorite things. The below recipe is the one taken directly from the aforementioned Tasty Kitchen, though I did not follow it exactly. I only have one bread pan (which I had to actually go buy because I didn't have any). So, first off, I halved it. 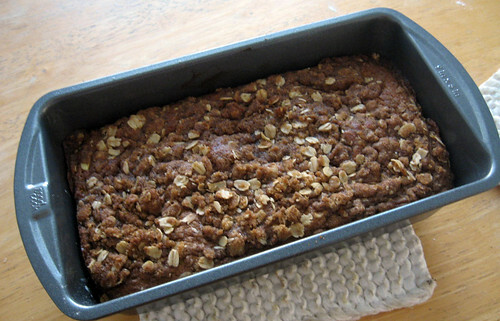 And secondly, I hate flax seeds with a passion, so did not include those in the streusel topping. I also did not put in the pecans out of sheer laziness and not having a food chopper. And being kind of sick of them after the pecan pie muffins. I also did not have some of the spices called for in the bread recipe. It turned out fine, but I suspect would've been even better if I had had those spices to add. 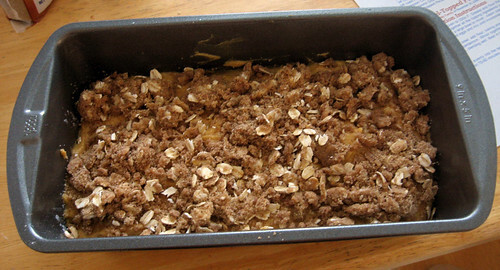 Here is the streusel topping. As you can see, I just used a fork. 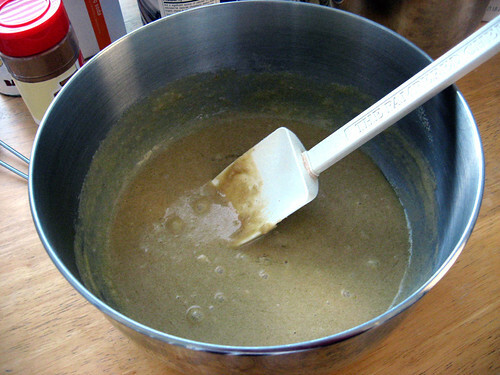 And here is the butter and sugars mixed together. I just did it by hand, again out of laziness for not wanting to get out my hand mixer. And a bonus tip! 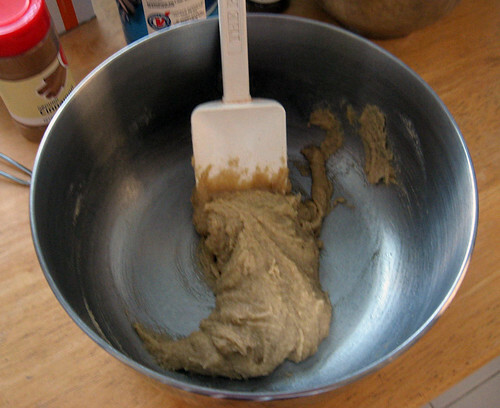 If you don't have dark brown sugar, don't worry. 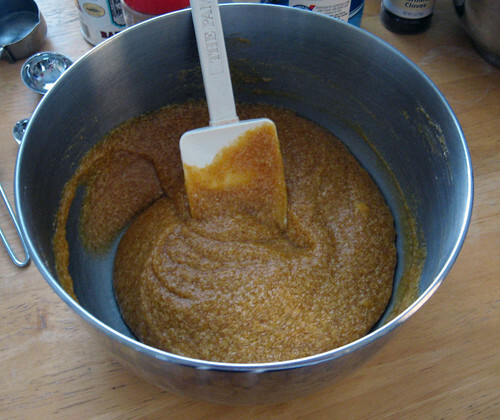 You can either add two Tbsp molasses to 1 cup white sugar, or 1 tbsp to 1 cup brown sugar and make your own! And the pumpkin! Oooh it's turning orange! And now the flour mixture is added in as well. And it's about ready to go into the oven! This pan was a 9" pan, so if you have an 8" pan, it would fill it a little bit higher. And, out of the oven. As you can see, it doesn't rise a lot. That's how sweet breads tend to be. Dense and delicious. The verdict is: yummy. I would say the only thing is that I definitely think it's probably better with the added extra bit of spices. It's fine without, just might add that something extra. 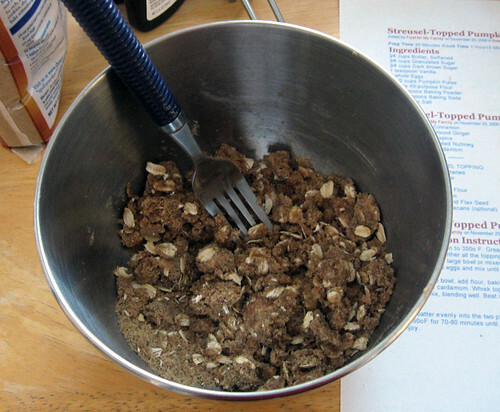 And I could've used even more streusel topping. And on the bottom I can taste some of the egg, but maybe I just didn't cook it quite long enough. But I was afraid of over-cooking since the pan was a slightly larger size. ANYWAY. It's good. 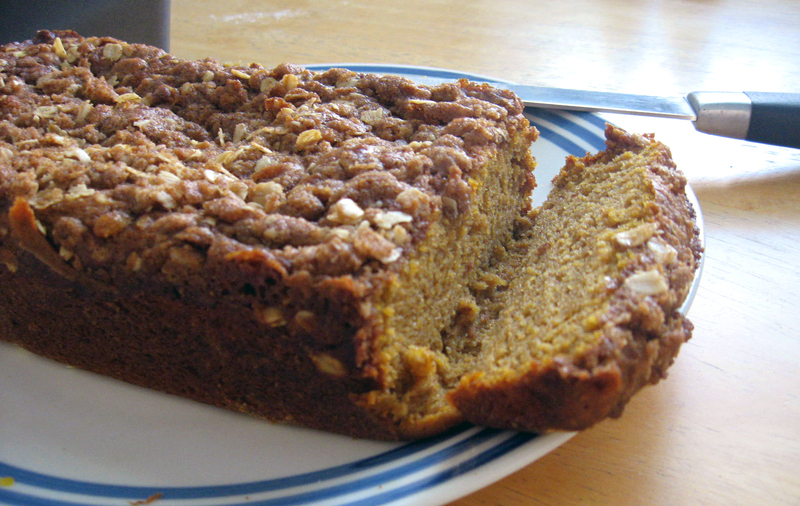 If you like sweet breads and pumpkin, you'll love this. Yes, it is finally time for autumnal spices and pumpkin-y things! Despite the not-very-inspiring weather over the weekend. Seriously, the weather here needs to realize that the time for summer has passed!